Honoree David Letterman waves from the balcony during the 2017 Mark Twain Prize for American Humor at the Kennedy Center on October 22, 2017, in Washington, D.C.
David Letterman is on the red carpet at the Kennedy Center in Washington, D.C., walking by a gauntlet of reporters who gathered Sunday night to ask him how it feels to receive the Mark Twain Prize, an honor bestowed annually on influential comedians. 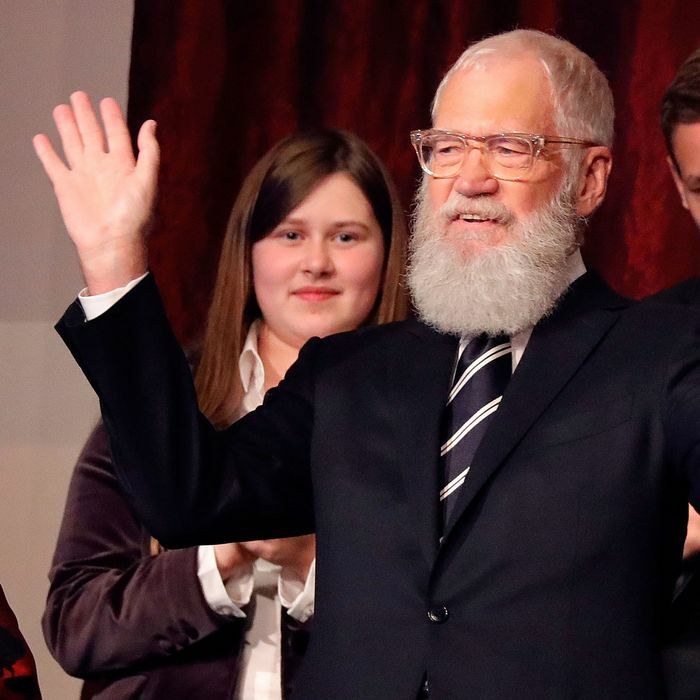 But even though this night is about him, Letterman can’t stop himself from doing what comes most naturally, and what, in part, made him such an exceptional late-night talk show host: displaying an interest in the person standing in front of him. In this case, that happens to be a reporter for the Associated Press, who is supposed to be interviewing Letterman but has had the tables turned on him. “About 15 years,” the reporter replies to the Cairo question. The questioning continues while a gaggle of journalists look on, so fascinated that they don’t even try to interrupt. This is Letterman, showing us all that he’s just as good at reporting as he is at telling jokes. That incident — in which the former host of The Late Show flipped red-carpet protocol on its head for a couple of moments — is emblematic of the entire Mark Twain Prize ceremony, which followed the traditional format for such formal lifetime achievement celebrations, but, in keeping with the Letterman sensibility, also refused to be too much about how great Dave is. During the tribute — to be broadcast Monday, November 20, at 8 p.m. on PBS — multiple jokes were made about Letterman’s post-retirement beard. Schumer — who noted that her first thought on being asked to participate in the ceremony was, Wow, Tina Fey must be slammed — was the only woman on the roster of celebrities honoring Letterman, which also included Bill Murray, last year’s Twain Prize recipient; Norm MacDonald; Senator Al Franken; Jimmy Kimmel; John Mulaney; Martin Short; Eddie Vedder, who did a lovely cover of “Keep Me in Your Heart” by Letterman favorite Warren Zevon; Fred Armisen and Bill Hader, who pre-recorded a segment in the style of their IFC series Documentary Now! ; and Jimmie Walker, who gave Letterman one of his first jobs in the ’70s, writing jokes for Walker’s stand-up comedy sets. The event was also a Letterman late-night reunion of sorts: announcer Allen Kalter acted as emcee, Paul Shaffer and the World’s Most Dangerous band provided the music, stage hand Biff Henderson made a brief appearance, and so did regular Late Night With David Letterman contributor Chris Elliott, who showed up to participate in a top-ten list during which, bless him, he did a bit vaguely reminiscent of his famed banana dance. In keeping with Letterman’s tendency to speak with blunt honesty, the lack of diversity, both in the talent slate and the audience itself, were acknowledged. “It says a lot about America,” said Short, “when different people of different white backgrounds can gather together …” There was more to the joke, but I couldn’t hear it because all the white people in the audience were laughing too loudly. Letterman’s legacy was certainly acknowledged — Franken referred to him as “the innovator who changed late night forever” — but a touch of cold water was thrown on his status as a truly original genius, too. Even the importance of the Twain Prize itself was exaggerated to the point of absurdity. Bill Murray, the holder of the Twain crown who was prepared to pass it on to Letterman, took that idea extremely literally, entering the Kennedy Center Concert Hall in the middle of the audience while dressed in full Elizabethan royal regalia. After discussing the perks of the job and demanding that a servant bring him a sandwich, he demanded that food also be served to everyone in Letterman’s section of the balcony, which it was. “Harry,” Murray said to Letterman’s now-teenage son, seated next to the honoree. “I want you to be a generous prince.” Murray then insisted that Harry throw a pickle or at least a piece of tomato down to the crowd below. Harry resisted at first, but finally, with his father’s encouragement, tossed what appeared to be a slice of dill down to those in the orchestra seats below. The numerous clips of Letterman’s work throughout his 33-year late-night career emphasized a lot of his signature material, including his penchant for pranks (his brief stint as an undercover Taco Bell drive-through employee was included, as was one of his many rounds of dropping stuff from the top of a building), his Stupid Pet Tricks, and his collaboration with his late mother, Dorothy Mengering. What the clips didn’t quite capture was what he displayed on the red carpet: his brilliance as an interviewer. Former First Lady Michelle Obama spoke to that when, via a taped tribute, she praised him for being “whip-smart” and “curious” about all aspects of life. Obama’s appearance wasn’t the only political aspect to the evening. When Mulaney mentioned President Barack Obama in passing during his remarks, the Kennedy Center audience spontaneously applauded. When he noted that not everyone was applauding — “What, some of you are still on the fence?” — he said Barack Obama’s name again to even louder applause. This stood in contrast to the response earlier in the evening, when Kennedy Center chair David Rubenstein mentioned Betsy DeVos’s name while reading a list of donors and sponsors and a noticeable “Boo” rippled through the audience. “You went out for a pack of cigarettes and left us with an orange stepfather,” he later added.